Composed of a 10mil (0.010 in.) 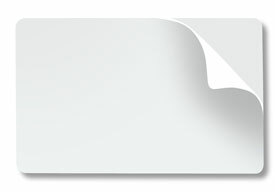 white PVC card with a 14mil (0.014 in.) adhesive Mylar back. Having the mylar backing, a thickness of 24 mil is achieved, providing a more rigid, stable card to pass through the printer (recommended for lamination). The best feature about this card is once its adhesive backing is pulled off, you are left with a nice thin 10 Mil card.